This issue of Cardiology Clinics, guest edited by Drs. 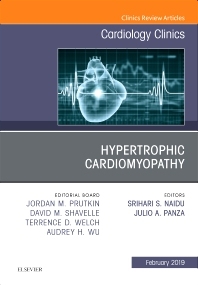 Srihari S. Naidu and Julio A. Panza, will focus on Hypertrophic Cardiomyopathy. Articles in this issue include: Historical Perspective and the Diagnostic Dilemma, Echocardiography for Diagnosis and Management, Cardiac Magnetic Resonance for Diagnosis and Risk Stratification, Genetic Testing and Counseling, Role of Advanced Testing: Invasive Hemodynamics, Biopsies and CPET, Lifestyle Modification and Medical Management, Arrhythmia Evaluation and Management, Sudden Cardiac Death Risk Stratification and the Role of the ICD, Choice of Septal Reduction Therapies and Alcohol Septal Ablation, Surgical Myectomy: Sub-aortic, Mid-ventricular and Apical, Advanced Heart Failure Management and Transplantation, Novel Pharmacotherapy, and Unresolved Issues and Future Directions.